I managed to finish my March goal for A Lovely Year of Finishes quite early, so this is just a recap for the sake of linking up and meeting my March goal requirements. 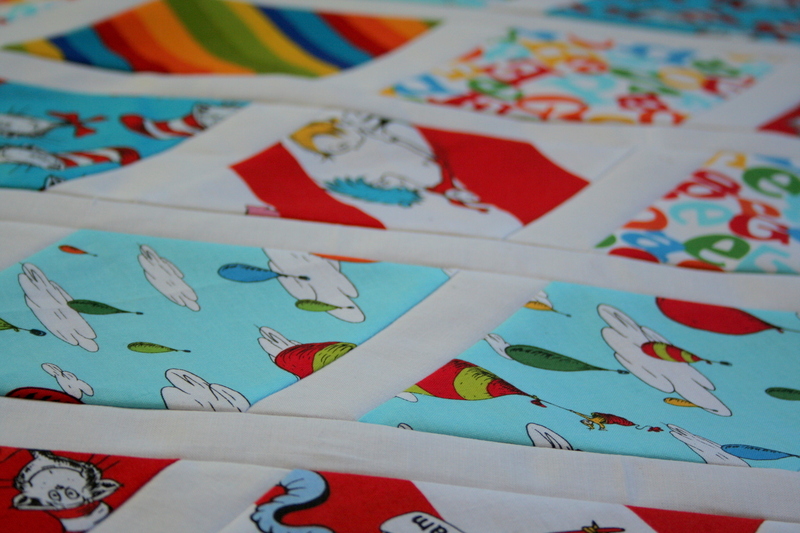 I basically began and finished the Dr. Seuss Diamonds quilt during the month of March, which is nothing short of amazing! It just goes to show how much tiny little windows of progress add up to a completed project. 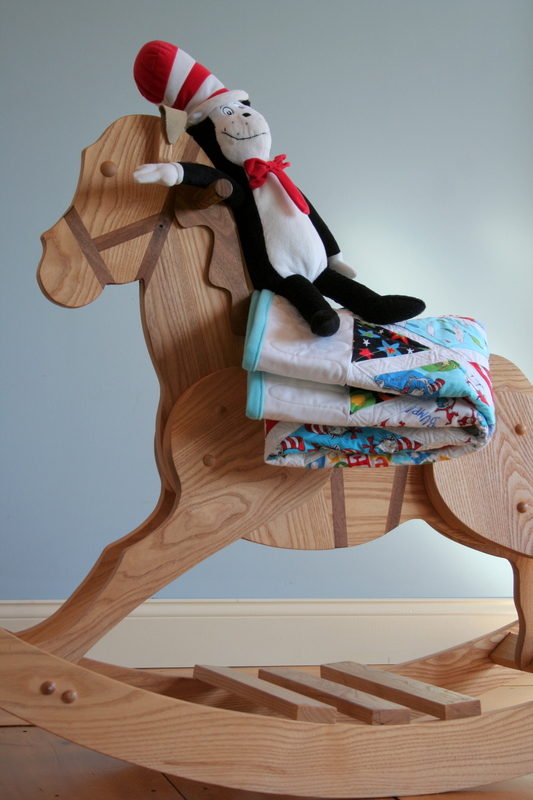 As I’ve said in previous posts, I made this quilt as a donation to a fundraiser at my daughter’s preschool. Each grade put together a basket to be either auctioned or raffled off at a Poetry Jam that took place last night, and the Pre-K’s basket had a Dr. Seuss theme. 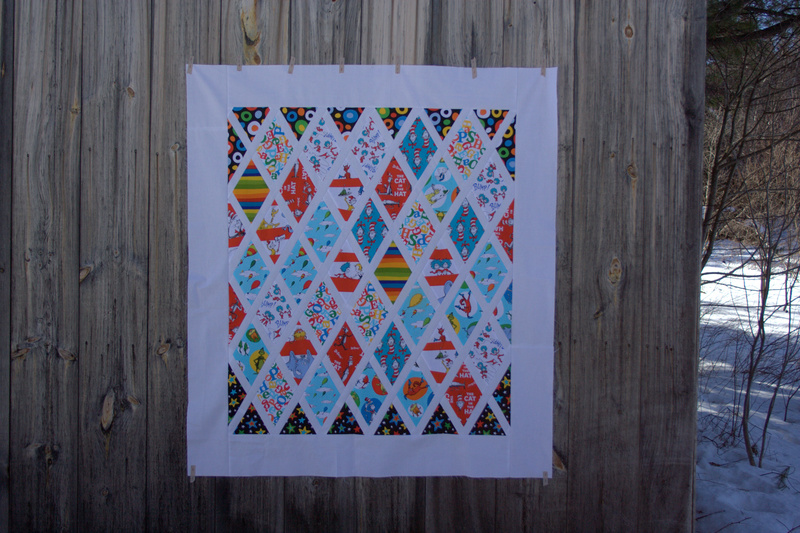 Here is my quilt, displayed under clear plastic (!!!) with the rest of the epically awesome Dr. Seuss raffle basket items. I’m happy to report that the fundraiser Poetry Jam went really well! The school raised over $700 from all of the baskets, which for a small rural school of only 50-60 students is pretty stellar! One of my daughter’s preschool friends won the Dr. Suess basket (and quilt), too, so I’m happy that it will be well loved. I have no idea how much the quilt and basket helped earn, but the ticket box was stuffed to the brim with tickets. I’m pleased as punch at the outcome. 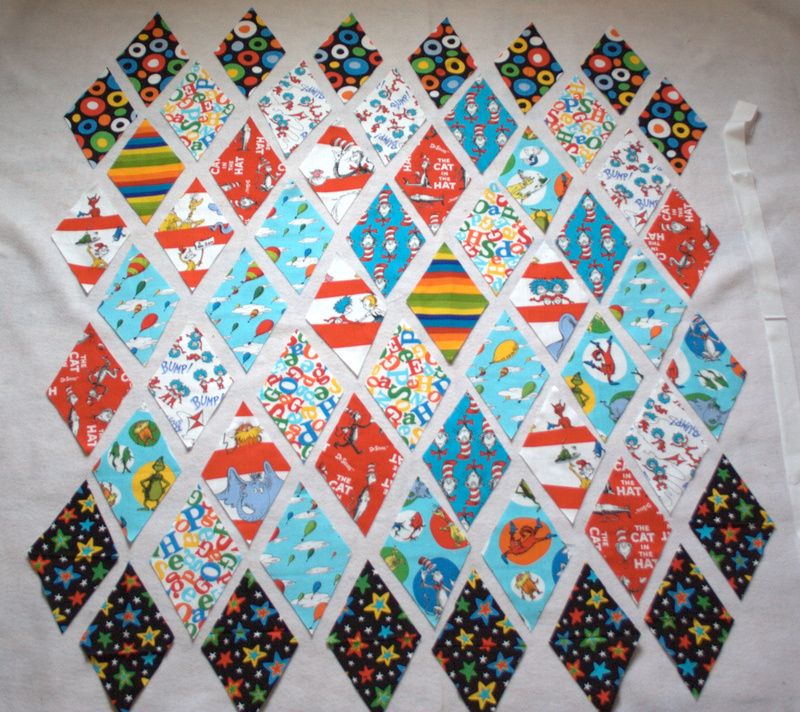 If you’d like to see more about the quilt, visit my post Friday Finish: Dr. Seuss Diamonds Quilt, or to see progress read When Duty Calls: A Dr. Seuss Raffle Quilt or Dr. Seuss Flimsy Finish. I’m linking up with A Lovely Year of Finishes, and I’m plotting what project to choose for April! I’m on a roll so far! 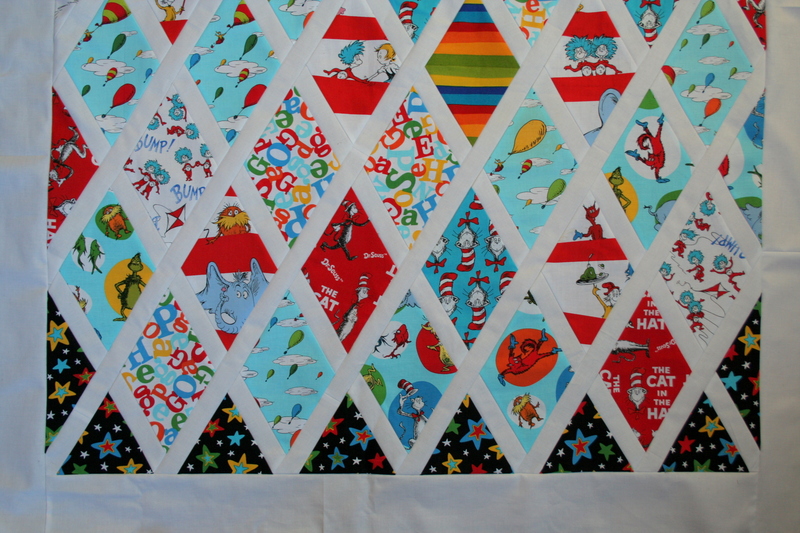 Just in the nick of time, I finished the Dr. Seuss quilt for my daughter’s preschool fundraiser. 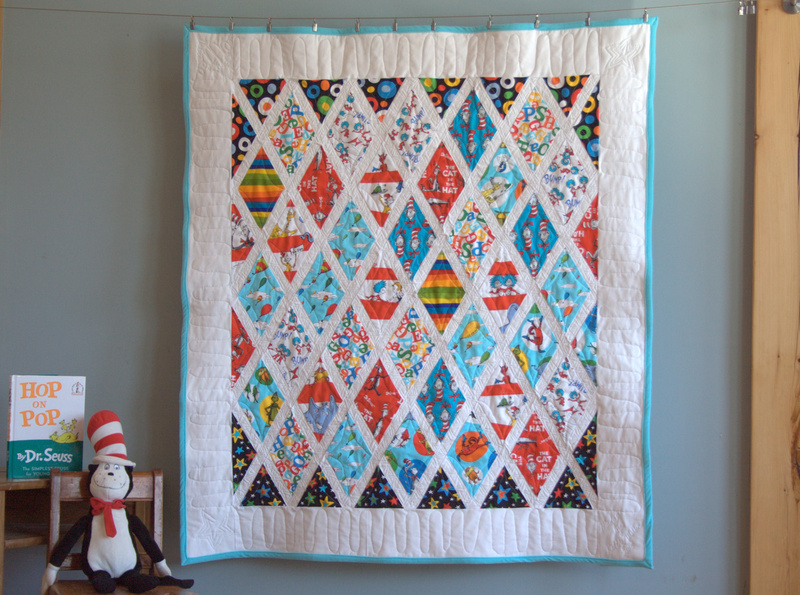 As I mentioned in previous blog posts When Duty Calls: Dr. Seuss Raffle Quilt and Dr. Suess Flimsy Finish, this quilt was created from an old work in progress for a fundraiser raffle at our local elementary school. Every bit of fabric used was already in my stash, with the exception of the polar fleece backing. 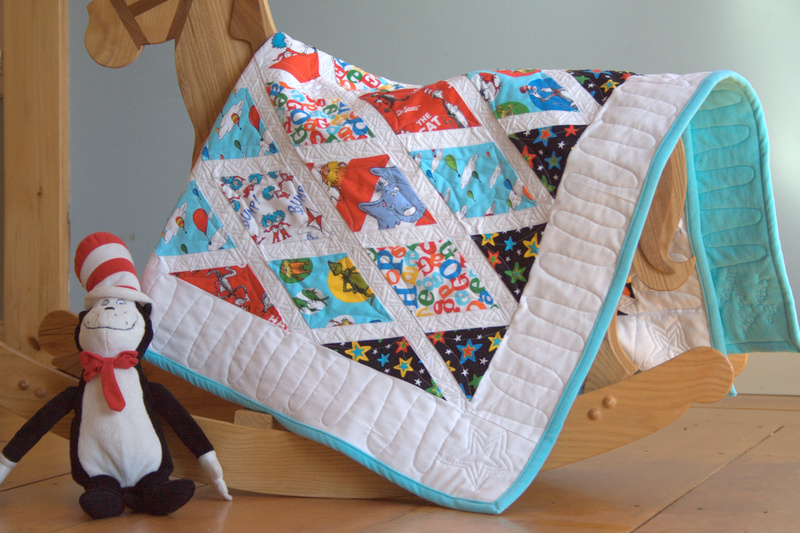 I am really happy with how the quilt came out, and finishing at 44″x51″, it is a decent snuggle size for a child to curl up under while reading a book. Before I go into the details of this finish, I want to extend a huge heartfelt thank you to everyone who commented on my previous Flimsy Finish post. 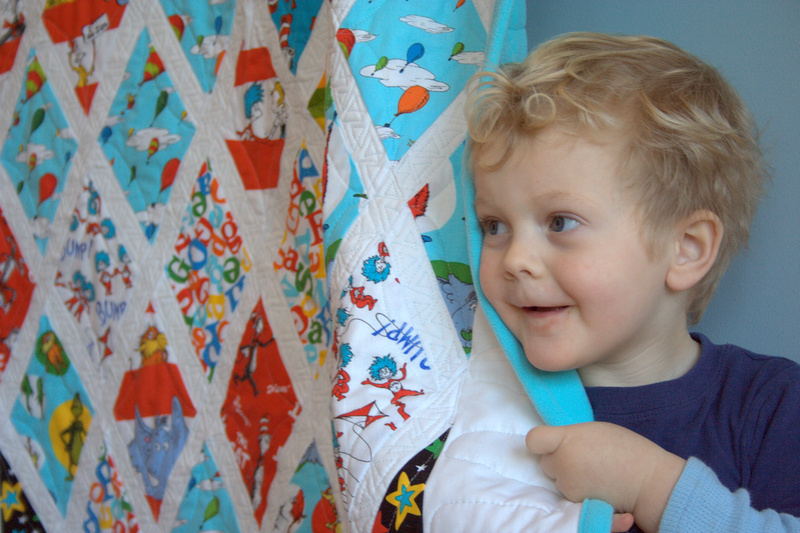 You helped me to realize the true joy in giving that is involved in donation quilts, and to feel entirely positively about the whole experience. 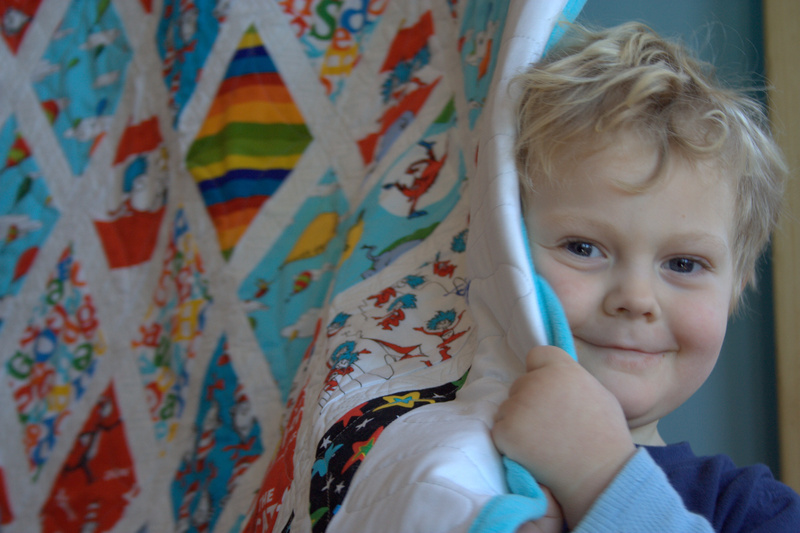 What matters most is that this quilt will be loved by a child, and that I have donated my time, skill, and materials to a cause in which I believe. 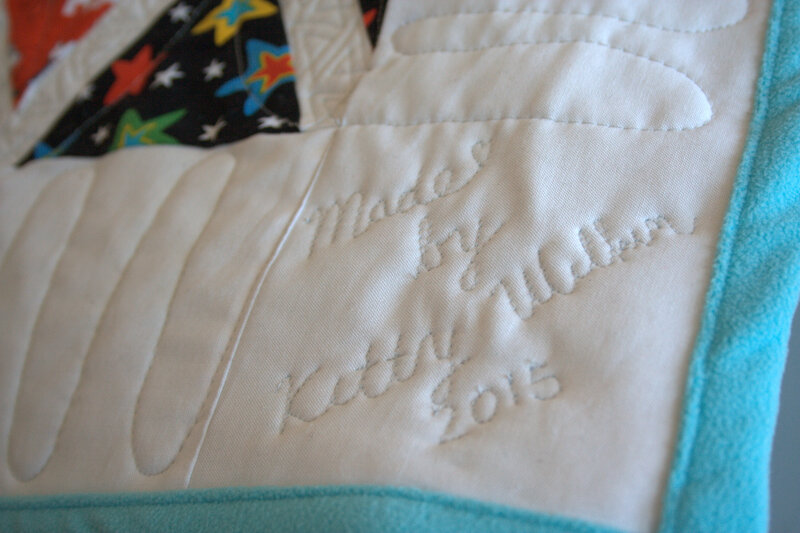 Hopefully the school and PTO will earn a good sum thanks to the addition of this quilt to the raffle basket, but even if not, the joy that it brings to a child–and really, to me for having the ability to donate such a labor of love–is what matters in the end. So THANK YOU! 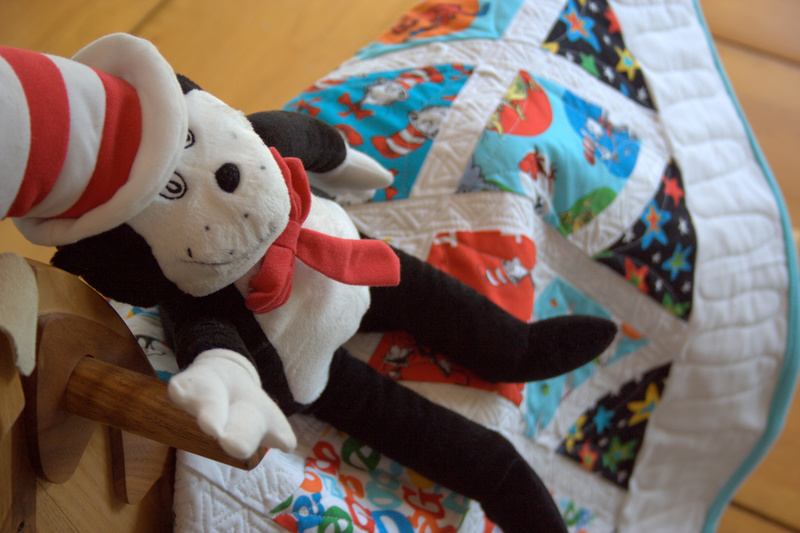 Mr. Cat in the Hat likes it, too! 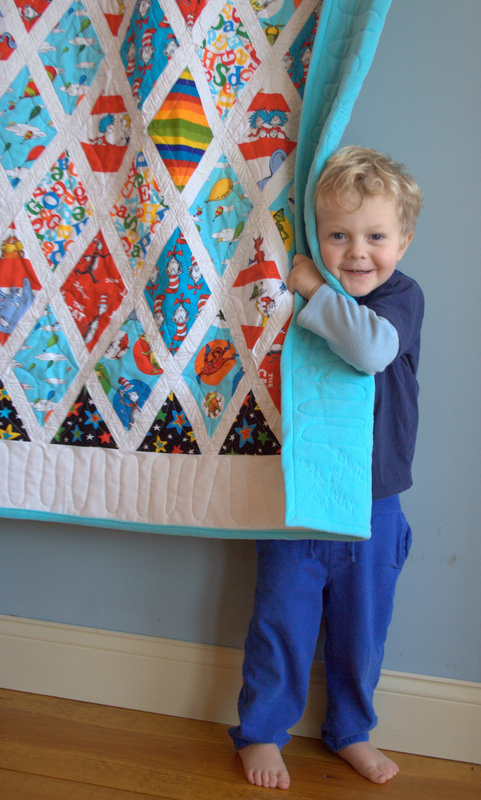 I backed this quilt with gorgeous turquoise polar fleece so that it is extra snuggly, and decided to use that same polar fleece backing to bind the quilt. 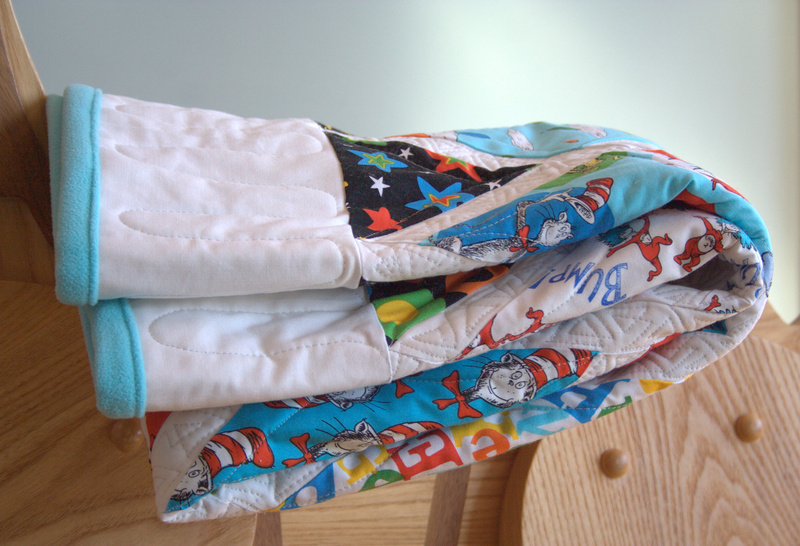 I wanted the binding to be extra wide, since it is so snuggly, so I trimmed the backing so that it extended 1.5″ from every side, then folded in half and then folded over the front of the quilt to make a 3/4″ binding, top stitched on the front. It was surprisingly smooth and easy, and I love the finished look! The free motion quilting shows nicely on the solid polar fleece back, and I almost like the back of the quilt as much as the front! 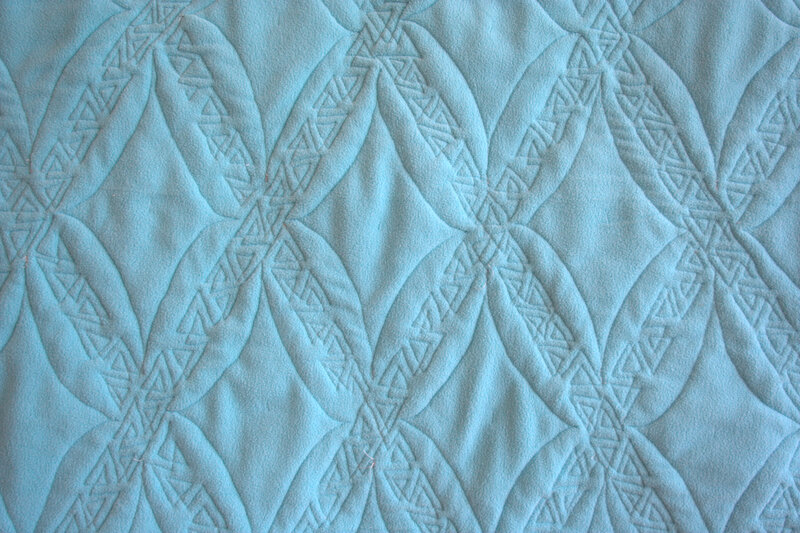 Free motion quilting detail on the back of the quilt. 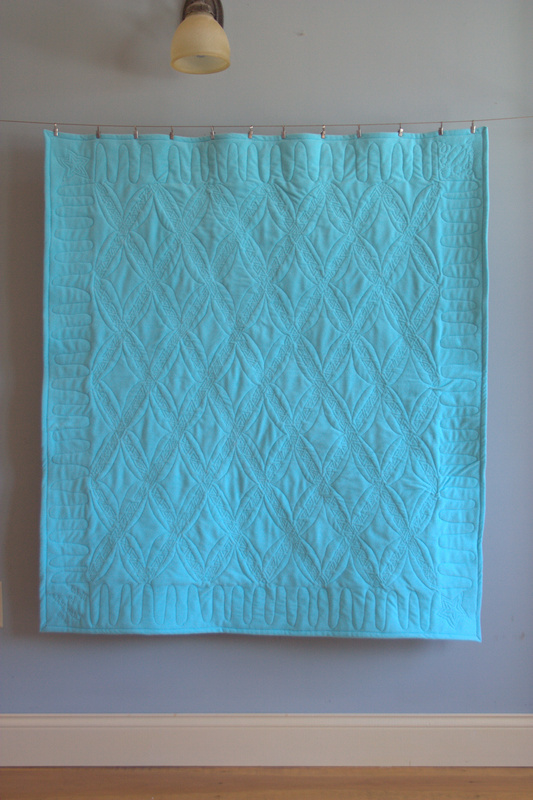 My free motion quilting (FMQ) is far from perfect, but I think it was an excellent design for this quilt layout. The wonky Seussical triangles I quilted on the narrow sashing crossed fairly smoothly, and the simple orange peel-esque diamonds hold it together nicely. 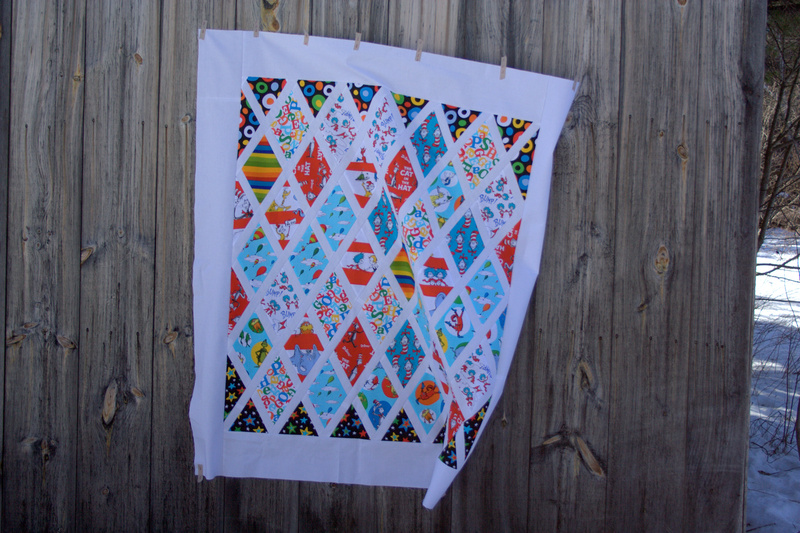 I used a wide wiggle on the wide white borders (can you tell I’m a total FMQ newbie? “wide wiggle”!? 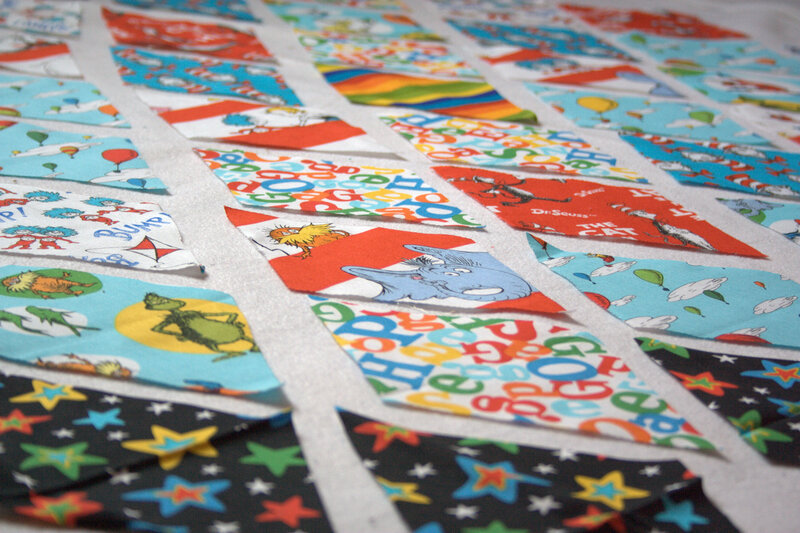 haha), and couldn’t resist the urge to do a bit of free form Dr. Seuss FMQ in the corners. I roughly quilted three Truffala trees with “Unless” written beneath in one corner, two Seussical stars in two opposite corners, and I quilted my “tag” into the final corner, since I didn’t want to mar the beautiful back with a cotton label. 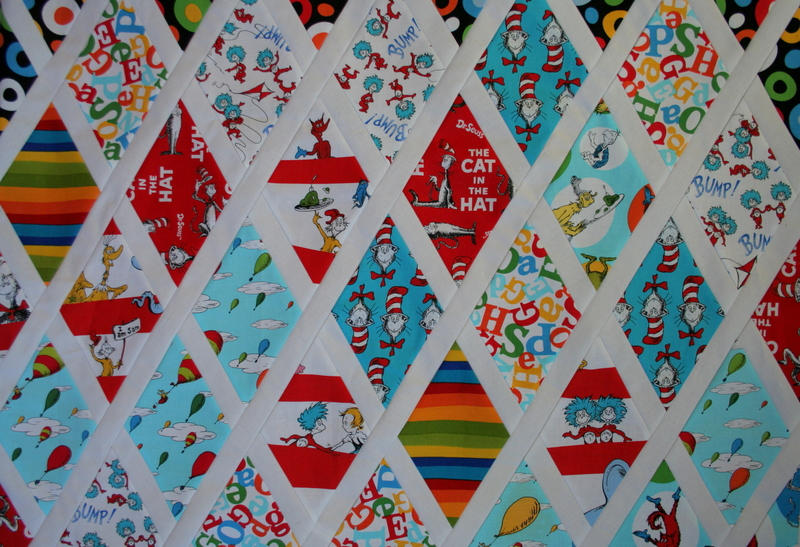 Front: Dr. Seuss fabric by Robert Kaufman Fabrics with Kona White sashing and borders. I’m linking up with TGIFF. I’m also going to link up with Yvonne’s Thankful Thursday since I’m truly thankful for you awesome quilting community, who helped me see the light about donation quilts. It’s all about the giving! Since returning from QuiltCon, I’ve had so many project ideas that I honestly haven’t known where to begin. There were of course the projects that I had in mind or in progress before leaving for Austin, but there were also new ideas that I wanted to sketch, create, and make happen. As the saying goes: when it rains, it pours; but sometimes it’s hard to find your way when it’s pouring. Then yesterday, while chatting with my daughter’s preschool teacher at pick-up about a raffle basket they are putting together as a fundraiser, the teacher casually asked if I could make a quilt or blanket for the basket. Each class is putting together a basket to be auctioned off as a fundraiser to help cover the costs of travel for their year-end field trip. 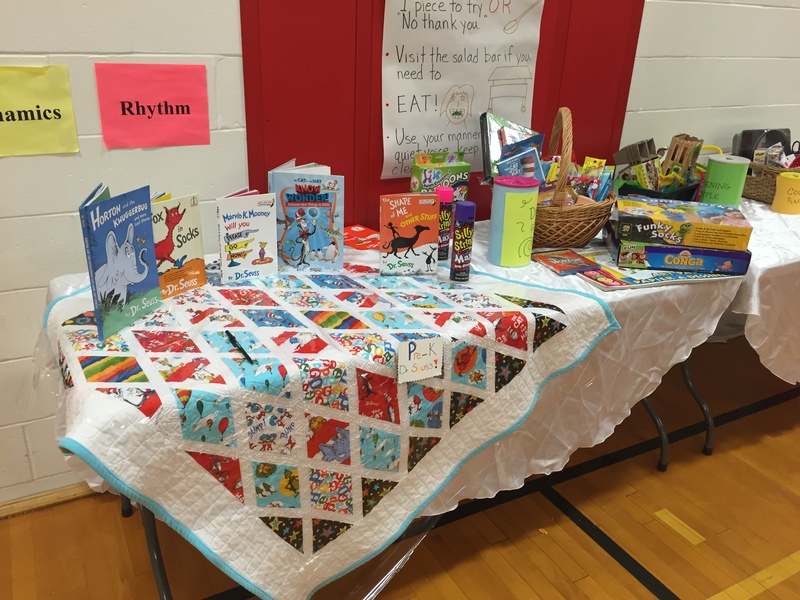 The preschool teachers had chosen Dr. Seuss as a theme, thinking that it would be easy to fill a basket with Seussical fun stuff. Parents have been struggling to find anything other than books, one movie, and a package of Dr. Seuss pens for the basket. With only 9 kids in the preschool class, they knew the basket would be smaller than the other classes, but still were a bit bummed at the turnout. 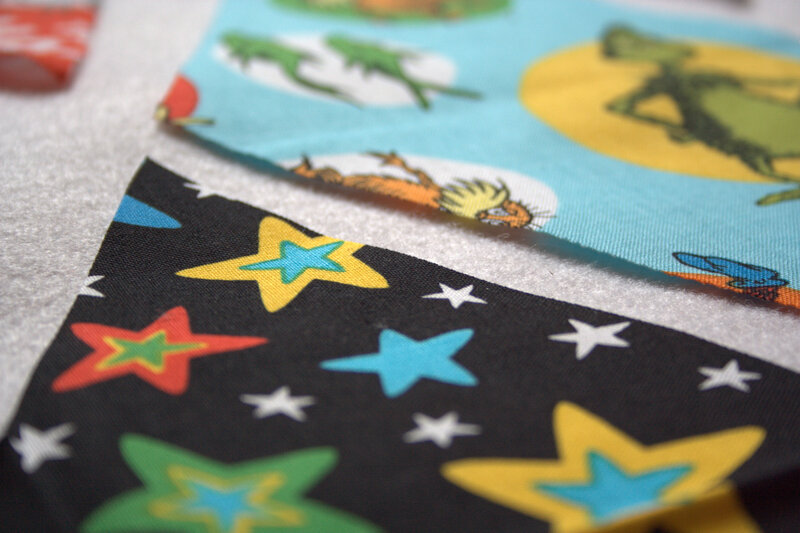 While this project doesn’t really fit my aesthetic, I think it will make a wonderful snuggle quilt for a special child to curl up in as (s)he reads his Dr. Seuss (or other) books. How could I resist a chance to make a quilt for a child, while at the same time helping support my daughter’s preschool class? 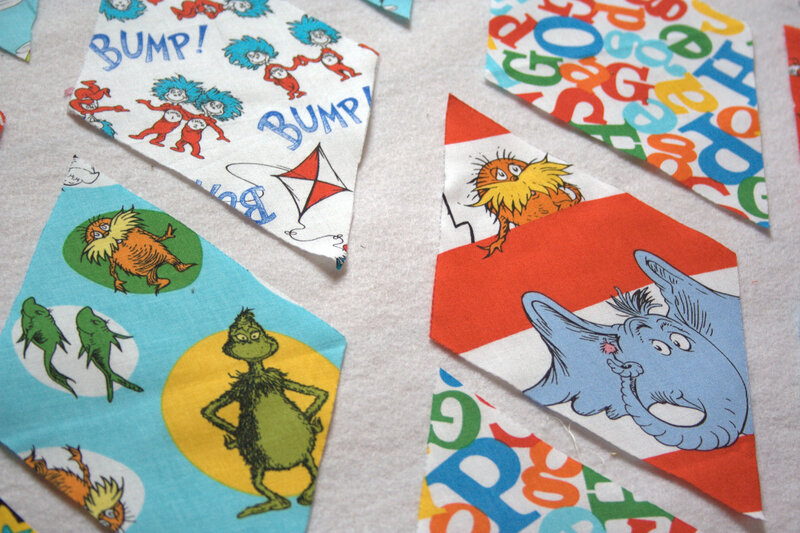 I came home, pulled out my long-buried WiP Seuss box, and spread these diamonds out on my fancy design floor. I plan to use white sashing since that was my original plan years ago and I already have the Kona white yardage. This will be a project entirely pulled from my stash. I’m using only the diamonds that have already been cut for the sake of time, so next up is to sew white sashing until the cows come home. I’ll then square up the quilt and most likely back it with fleece so that it is super snuggly. I love the black background prints in this fabric line, and if I were to plan out this quilt again, I would probably use the black stars and/or dots as sashing. Many of the other prints are very white-heavy, so the white sashing might make them fade out a bit. But, with a donation project with a timeline of a week and a budget of nil, it is what it is. I have a feeling the recipient will love it anyway. Just like that, my next project has been chosen for me. I would never have guessed my first big sewing project upon my return home from QuiltCon would be my oldest, long-abandoned work in progress. But when duty calls, Mommy must answer. 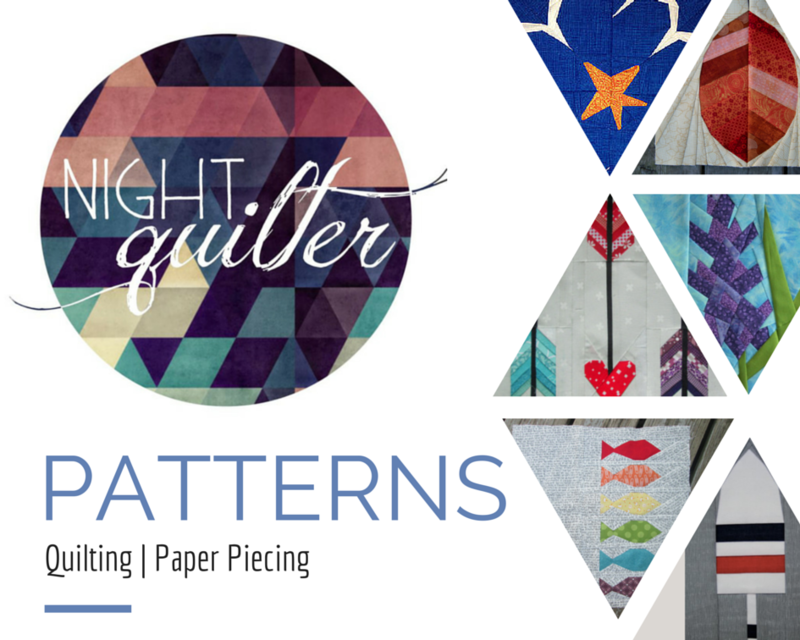 I’m linking up with Lee at Freshly Pieced for WiP Wednesday. I thought I might be exhibiting some of the great inspiration and modern quilting knowledge I learned from Lee, but not yet! I’m also claiming this as my March goal for A Lovely Year of Finishes. I MUST finish it!